Meet Luna's brother and Gladio's sister. 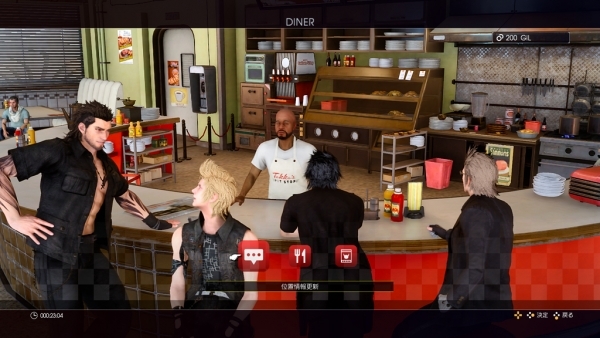 Square Enix has released new Final Fantasy XV information and screenshots, introducing the newly confirmed characters Ravus Nox Fleuret and Iris Amicitia, dialogue choices, the various shops you’ll visit, Mobhunt side quests, co-op attacks, and ally instruction. Lunafreya’s older brother. He was once a man of the Tenebrae Kingdom, but now belongs to the Niflheim Empire. 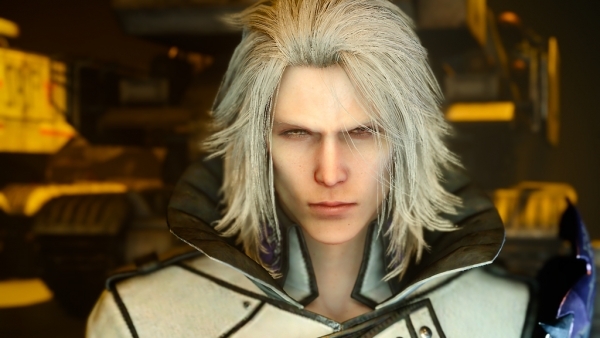 Ravus also appears in the feature-length CG movie Kingsglaive: Final Fantasy XV. Gladilous’ younger sister. She escaped the Capital City after it was attacked by the Niflheim Empire and is now living in the city of Lestallum. 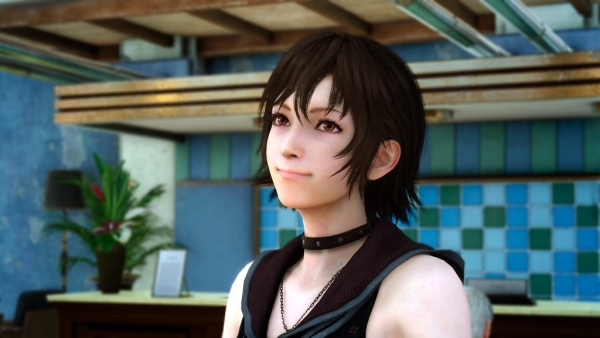 She has known Noctis and Ignis since she was a child, and is a trusted friend. She is a strong girl at her core who can still be positive even in a tough situation. Iris appears as a child in “Episode 3: Sword and Shield” of the five-episode anime special Brotherhood: Final Fantasy XV. In Final Fantsay XV, she appears as a grown woman. During the story and on your journey, there will be conversations that require you to select an answer from multiple responses. How the conversation plays out and the contents of the parameters you obtain will change based on your response. 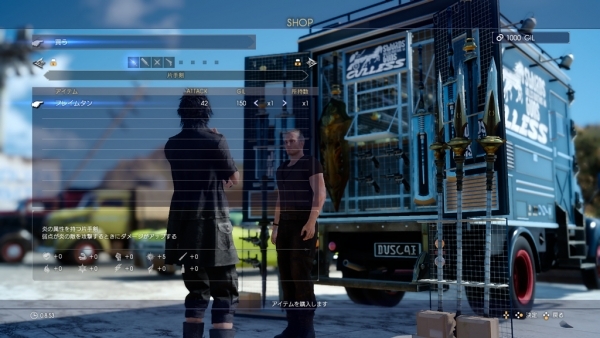 Various shops are scattered throughout the world of Final Fantasy XV. Stores have a distinct look depending on where they’re located, and you should also take note of what they have in stock. 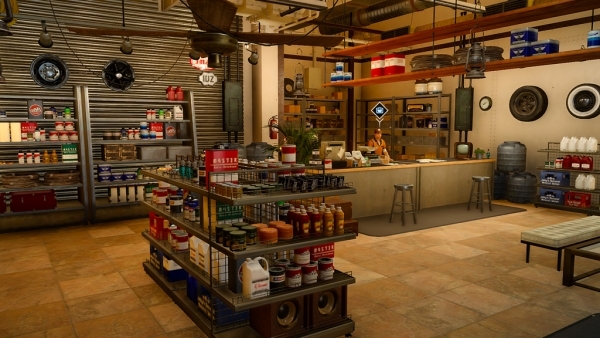 Shops sell the various items that are indispensable to your journey. From Potions that recover health to ingredients necessary for cooking and so on, just looking at all the different things you can buy is fun. Diners, where you’ll recover from the hunger that builds up on your journey, are not only where you’ll eat meals, but they’re also a convenient place to obtain information and take on subjugation quests (Mobhunts). These are shops that deal mainly in weapons. Since the weapons offered differ based on the location, you should of course drop by new shops you discover to check for new weapons. 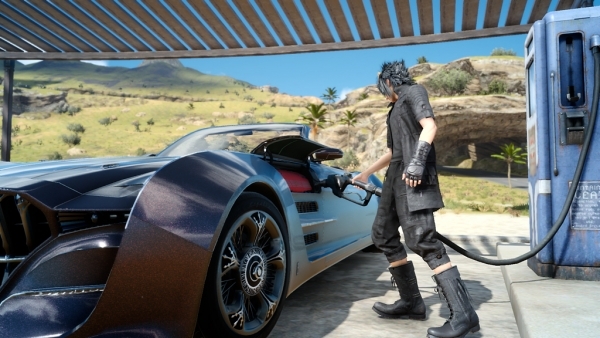 Your car is your main method of travel in Final Fantasy XV, and since the car becomes immobile when it runs out of gas, you should regularly stop at gas stations to fill up the tank. 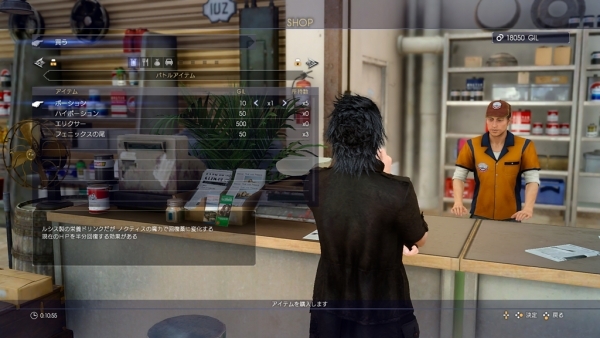 In addition to the main quests that affect the progression of the story, there are also a variety of side quests along the way. 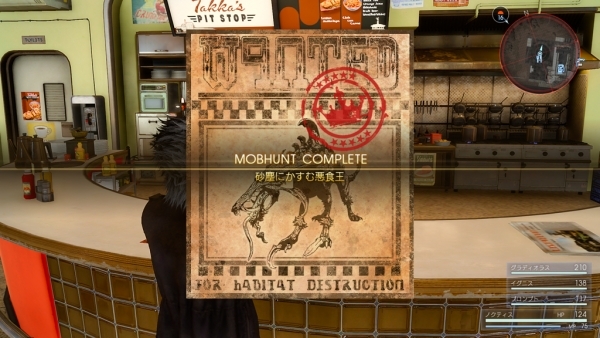 From information brokers, you can take on “subjugation quests’ known as Mobhunts. Through these quests you can obtain rewards that you can’t get anywhere else, as well as take on formidable foes. The quests you take on are up to you. 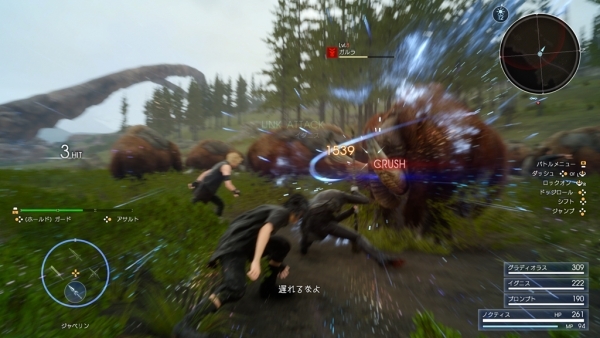 Co-op skills called “Links” will automatically be triggered when certain conditions are met during battle. There is a great variety of variations per character. 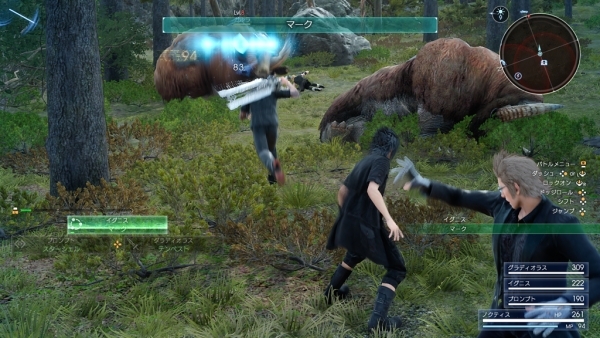 Noctis kicks up the spear he is holding in his hand, and at the same time Ignis jumps high up into the air and catches the spear before stabbing down at the enemy to deal great damage. 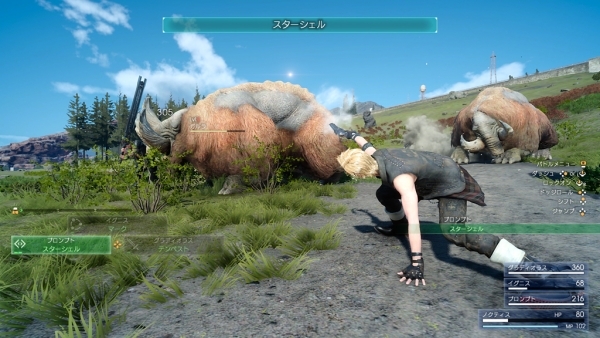 If you successfully attack the enemy from behind, a Back Attack Link with Gladio can be triggered. 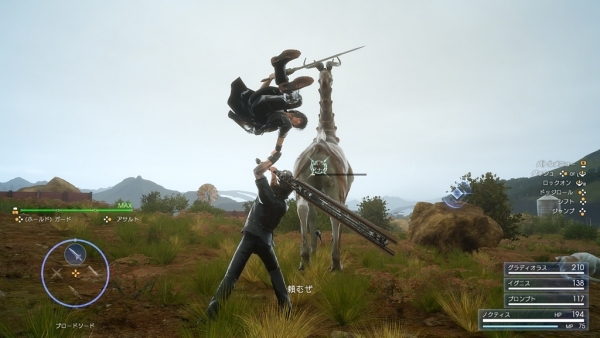 Gladio grips Noctis’ hand and vigorously lifts him up for Noctis to deal damage from the air. In battle, in addition to “Links” where you borrow the power of your allies, players can provide their allies instruction via “Commands.” There are various types and effects for each character. By launching a bullet that glimmers like a star, it will attract the attention of the enemy and halt its movement. 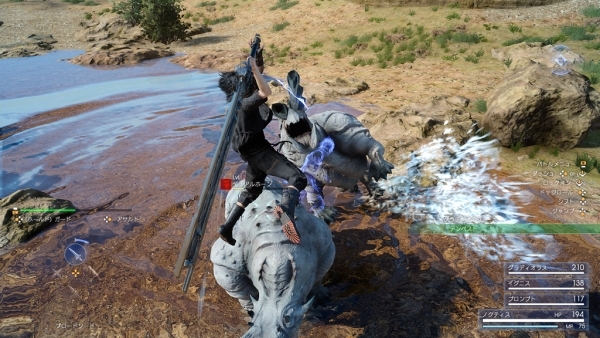 Gladio swings his body while wielding a large sword and sweeps away the surrounding enemies. 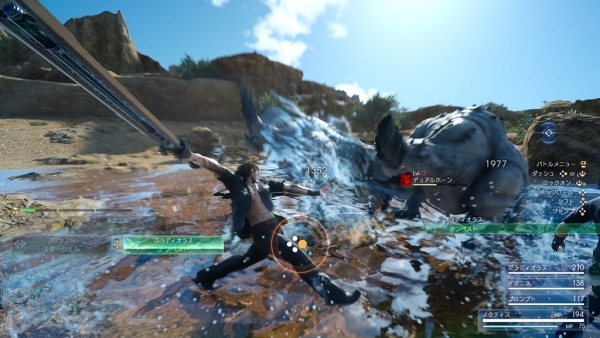 A followup attack from Noctis can be triggered with successful additional input. 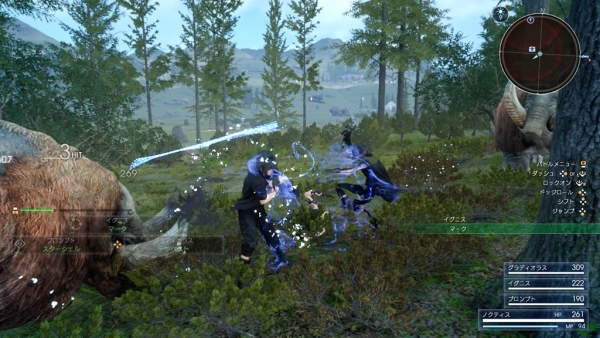 Ignis throws his daggers to create several targets indicating where Noctis should attack. 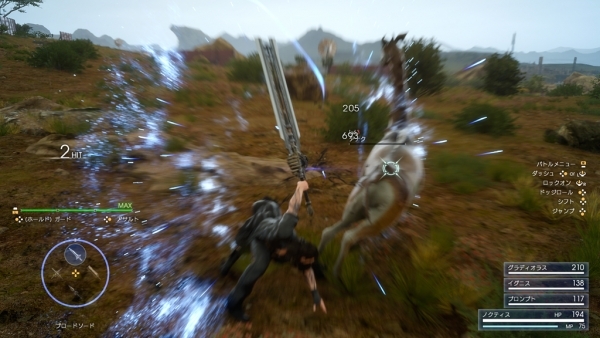 Immediately following, Noctis quickly moves between each target to drives in his attacks. 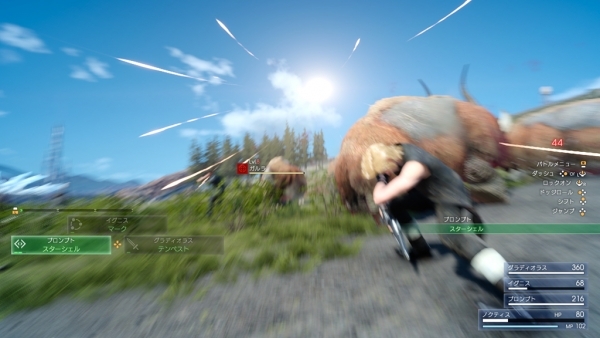 Additionally, Square Enix of America has announced “Carbuncle Surprise,” a new campaign where everyone who pre-orders Final Fantasy XV from the Square Enix Online Store will be automatically entered and eligible to win themed digital and physical prizes, including the grand prize of a new Audi Sedan. 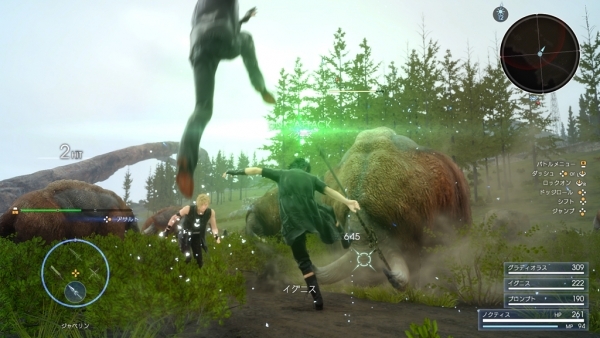 Final Fantasy XV is due out for PlayStation 4 and Xbox One on September 30.